I suppose it is inevitable in some ways that despite my fascination with dreadnought battleships and fleet actions I find myself increasingly looking at naval actions at a much lower level. In the context of WW1 - and ignoring the gunboat type of action for the time being - this leads to actions involving cruisers and destroyers. I must confess that some of the best naval games I have ever taken part in have not been the great slugfests between lines of battleships (although they do have a fascination all of their own) but actions involving single cruisers or small surface action groups. In recent times - no more than a few years ago - I fought a number of actions in 1/3000th representing the Balkan Wars. The forces were not large but nevertheless gave some very good games - more so on the tabletop than in history if truth be told. Moving on to the Great War then we have the potential for some cracking actions - both historically and the all important 'what if'. The exploits of the German cruisers in the early years of the war - Von Spee's Far East squadron, the cruise to the Emden, the escape of the Goeben and the Breslau and the hunting down of the Konigsberg for the basis for some cracking refights - and again, the all important 'what if?'. Going back in time to the days of the legendary Madasahatta campaign I seem to recall (and no doubt stand to be corrected) that the naval side was quite small in scale although a few dreadnoughts were involved - not so much on a squadron basis, more like a couple or so at any given point. This is the size of action that works best for me so the cruiser scaled engagements of WW1 tick a number of boxes. With this in mind - and if I am completely honest very much on the spur of the moment - I acquired via EBay the title you see above for a give away price. 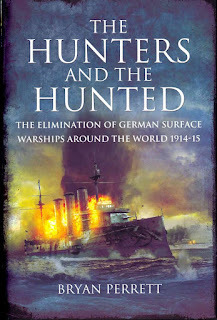 It is the usual Pen and Sword style title and is an account of the exploits of the German cruisers at the start of the Great War and of the Royal Navy efforts to bring them to account. This they did but not without cost. From a naval wargame perspective the old standby of 'Hunt the Raider' is an ideal scenario generator - and given that 'hunters' were often older or less effective vessels the player has a number of challenging decisions to make in respect of how he conducts his operations. Bryan Perrett is a well known historian and his account is a superb introduction to the subject. I have more detailed works on the period but as a one stop primer this is hard to beat. I suspect it has been remaindered which is why i was able to get it so cheap but even at the full price i would have been tempted. Mmmm - obscure and exotic - just how I like my wargames! Some time ago that very nice chap Kaptain Kobold happened to mention that a friend of his has written the above tome and that it was available as a PDF from the Wargames Vault. I had a quick look and duly acquired the same and am I glad I did! The book is quite simply simply outstanding. 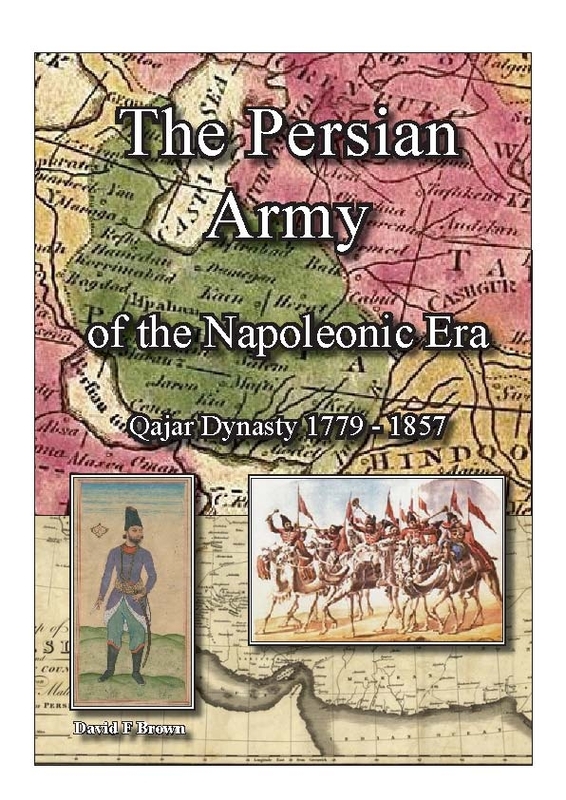 It contains a history of the Persian army over the period in question as well as details of the numerous battles they fought - against the Turks, Russians, British, amongst themselves and against any number of assorted petty Khanates and tribal types. There are illustration galore - many in colour - with many of the being reproductions of assorted watercolours painted by the numerous Western travellers in the region. There are also a number of very nice battle maps that could easily be turned into tabletop games and so in many ways the title is a 'one stop' reference book. I fully intend printing off a hard copy of this and am only sorry that someone has not picked it up to publish as a book - I would certainly add it to my collection! 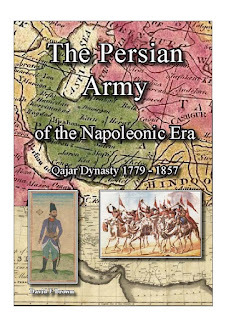 Given the variety of opponents the Persians fought against and that the title runs up to the war against Britain at the very end of the period covered it does present me with a rather interesting option for something Crimean War based. There are also some rather nice figures available for the period as well - 15mm from Irregular Miniatures and 28mm from Westfalia Miniatures. Much to ponder here methinks. Way back in 2012 I received a copy of the above film on Blu-Ray for a birthday present. Needless to say given my longstanding interest in the life of Lawrence I was highly delighted. Contained within the case was the option to obtain a free digital download using a special code from Ultraviolet. I duly did this but at the time I was using my old HP netbook and try as I might I could not get the wretched thing to load or run. After several attempts I gave it up as a bad job and resigned myself to only watching the disc itself (which I have, several times, all in the name of, ahem, research....). Imagine my delight then, when I discovered an App for my IPad which enables you to watch or download Ultraviolet films called Flickster. After a few emails to Ultraviolet to sort out my account details - email and password, you know the kind of thing - I was able to download David Lean's epic film and am now watching the same on my train journey to and from work. As an aside watching a film set in the desert on a cold, dark and frosty morning certainly has the psychological effect of warming you up slightly! I wonder where this could possibly be heading? First of all a very happy new year to one and all! Like many others I shall back on the treadmill tomorrow and the holiday seems to have flown by. I have not achieved very much on the hobby front to be honest but I have managed to get some ideas together - rather I have given some form to some older ideas - and these will form the basis of this post and the activities of the coming year. The additional bases I needed for the models have been ordered so it is merely a case of acquiring the extra models I need for this project to really get under way. I have all the Heroscape hexes I need and I have also made a start on drafting the rules for use when I refight the battle. All told there are around 60 triremes of various sorts to be painted but they will be easy enough to do once I can get to them. I will certainly be commemorating the centenary of the battle in some form but as yet I have not decided exactly how. It may well be I will revert to using the Avalon Hill Jutland game as it is simple to put together and gives a nicely representative action. This is going to be a slow burning and long term project - mainly because I have yet to decide which pair of the four main wars I want to tackle. WW1 is a certainty but I am wrestling with the choices from the 19th century. The main protagonists are of course Russia and Turkey but there are a number of potential twists that could be applied to the mix. The Persians and assorted Asiatic tribes could readily feature and it would not be stretching a point too far to include the British Indian Empire. I need to think about this in more detail but my thoughts at the moment are very much looking towards the 1880s as a good compromise. I want to tackle something from both genres if possible but only as a sideline - the list above will give me plenty to be going on with - and am keen to take a look at both Frostgrave and Dragon Rampant in due course. The size of force required for both of these is fairly modest which is a very important consideration in respect of the time I will have available. In the meantime though I shall continue to use the block armies on an ad hoc basis as and when I need to get my gaming fix. One thing that will need to happen though as a matter of priority is that I will once again need to have a long and hard think about what I want to hang on to as the man cave is getting a little, how shall I put it, crowded!